Another day, another keyword. This time, we're going to see who has to stop and face the music, with a big brass band of ... well, fleet brass. Admirals, that is. Yep, another big stopper potential... but this time, instead of just threatening to stop everybody, it's on a sliding scale. So if your opponent hits this early in the game before you've got all your Admirals in play, you'll still get an effect from it... just not as good as you might like. But the longer the game goes on, and the more Admirals you get into play, the stronger this little two-cost dilemma will become! So, just how strong can we make it? Well, let's just see. Obviously, most of the Admirals in the game came from the Federation, so we'll wait and look at them later. But this dilemma isn't only for them! Other affiliations can get in on the action as well. The Romulans, for instance, get a couple of Admirals. Throw in Martia as well and you've got three stops, which isn't bad for a two-cost dilemma. You'll probably want her to copy from Mendak, so you can grab his Intelligence or Transporters, as they both tend to be a bit more rare, and useful. So three stops for two counters isn't that bad... and that's from the affiliation with the least potential use for this card. Starfleet gets several of their own. They have access to Admirals Leonard and Forrest, of course. But more importantly is the non-unique Mirror Admiral, Logan Black. With these three plus Martia, they can get six Admirals in play. And six stops for two cost is certainly nothing to sneeze at! You're probably already playing with either Leonard or Black anyway, because their quick ship downloads make it easier to be assured early ship access without needing to stack too many. If you're using Martia, she can copy Forrest's Medical, which is always useful (Black's Law would also be good, but if you've got three of him in play, you probably don't need more). And since the total cost of these six Admirals is only 14, it'll only take you two turns to play them all (plus, that's six useful personnel to use later... and a handful of ship or Maneuver downloads if you want them). All in all, a pretty effective theme to build part of your deck around; when you consider that the average mission team doesn't go above nine, stopping six of them pretty much ends the attempt entirely. Speaking of ending a mission attempt entirely, here's the group that can do that every time. Or should I say, "groups". The Federation has access to a whopping ten different Admirals. And eight of those are Earth-icon, meaning they have two different headquarters to report to. In addition, one of them is non-unique, putting the count up to eleven at most Earths, and thirteen at the Next Gen Earth (12 and 14 with Martia). As if that wasn't bad enough, three of them even have Treachery, opening those up to Maquis influence as well! So, what do we do with all this blue brass when they're not stopping entire mission teams in a single go? Well, like Starfleet, they seem to have no shortage of ways to get ships into play, which is always useful (who doesn't need a ship?). Leyton can grab you one pretty quickly (The Prometheus is nice and fast... plus you've got no shortage of Command stars with all these Admirals around), or Janeway can use How Would You Like a Trip to Romulus?. 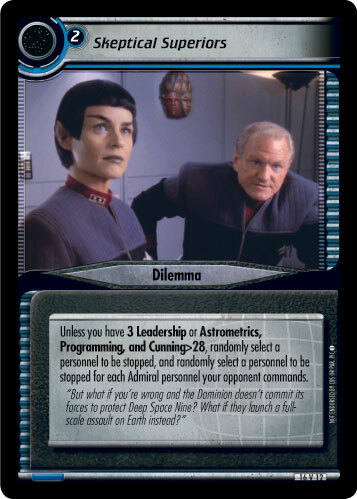 That card actually has several uses in this deck, since you can use it with Admiral Kirk to grab a copy of the U.S.S. Enterprise (even in a non-TOS deck, he let's you play Earth's Saviour), or with Admiral Riker to grab a copy of the U.S.S. Enterprise-D (though he does only work like this for a Next Gen deck). Or better yet, if you draw one of those ships first, you can use the Trip to Romulus to grab their corresponding Admiral-Commander and boost your Admiral count that way. The surprising thing with this deck is that your Admirals don't have to just sit around the headquarters waiting for a chance to stop an opponent! No, these deskjockies actually seem to be surprisingly good at attempting missions. We've got Kirk, Original Thinker leading the charge of course, blasting past dilemmas when your team is in danger. But the rest of them contribute most by helping you to form a small team to minimize the dilemmas played against you. They've got a similar set of primary skills (almost all of them are DipHoLes -- having Diplomacy, Honor, and Leadership, for the uninitiated), letting you focus your mission selection on those three. They've got a diverse set of secondary skills (after the DipHoLe combo) to get you past any dilemmas that you do face, and they have a lot of attribute boosters to help keep your mission-completing team small. All in all, not too bad a group of folk to build a deck around. Next time... putting the honor back in politics.